This article is about the communal dwelling. For longhouses as a place to urinate and defecate, see Outhouse. For the religious movement, see Longhouse Religion. Many were built from timber and often represent the earliest form of permanent structure in many cultures. Types include the Neolithic long house of Europe, the stone Medieval Dartmoor longhouse which also housed livestock, and the various types of longhouses built by different cultures among the indigenous peoples of the Americas. The Neolithic long house type was introduced with the first farmers of central and western Europe around 5000 BCE—7000 years ago. These were farming settlements built in groups of about six to twelve and were home to large extended families and kinship. 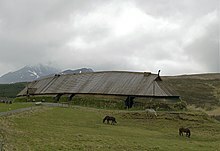 The Germanic cattle farmer longhouses emerged along the southwestern North Sea coast in the third or fourth century BC and might be the ancestors of several medieval house types such as the Scandinavian langhus, the English, Welsh and Scottish longhouse variants and the German and Dutch Low German house. The longhouse is a traditional way of shelter. The Western Brittonic 'Dartmoor longhouse' variants in Devon, Cornwall, and Wales where it is known as the Ty Hir. Located along a slope, a single passage gives access to both human and animal shelter under a single roof. The Western French longère or maison longue from Lower Brittany, Normandy, Mayenne, Anjou (also in the Cantal, Lozère and the Pyrenees Ariège), is very similar to the western British type with shared livestock quarters and central drain. The Old Frisian longhouse or Langhuis that developed into the Frisian farmhouse which probably influenced the development of the Gulf house (German: Gulfhaus), which spread along the North Sea coast to the east and north. Further developments of the Germanic longhouse during the Middle Ages were the Low German house in the North and especially Northwest Germany and its northern neighbor, the Geestharden house in Jutland including Schleswig, with its variant, the Frisian house. With these house types the wooden posts originally rammed into the ground were replaced by posts supported on a base. The large and well-supported attic enabled large quantities of hay or grain to be stored in dry conditions. This development may have been driven because the weather became wetter over time. Good examples of these houses have been preserved, some dating back to the 16th century. The longhouse was 50 to 60 feet long. 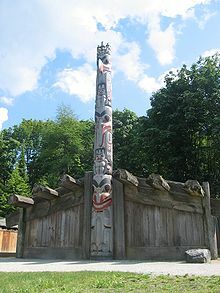 In North America two groups of longhouses emerged: the Native American/First Nations longhouse of the tribes usually connected with the Iroquois (Haudenosaunee) in the northeast, and a similarly shaped structure which arose independently among the indigenous peoples of the Pacific Northwest Coast. The longhouses inhabited by the Iroquois were wood boards/bark-covered structures of standardized design "in the shape of an arbor" about 6 to 7 metres (20 to 23 ft) wide providing shelter for several related families. The longhouse had a 3 metres (9.8 ft)-wide central aisle and 2 metres (6.6 ft)-wide compartments, about 6 to 7 metres (20 to 23 ft) long, down each side. The end compartments were usually used for storage. Hearths were spaced about 6 to 7 metres (20 to 23 ft) apart down the aisle, with smoke holes in the roof. Two families shared each hearth. Each longhouse would house several generations of an extended family; a house was built proportionately to the number of families it was expected to contain and might be lengthened over time to accommodate growth. It is possible to infer the population of an Iroquois town from the size and number of longhouses it contained. In South America, the Tucano people of Colombia and northwest Brazil traditionally combine a household in a single long house. The Xingu peoples of central Brazil build a series of longhouses in circular formations forming round villages. The ancient Tupi people of the Brazilian coast used to do this as well. The Yanomami people of Brazil and Venezuela build a round hut with a thatched roof that has a hole in the middle, called shabono, which could be considered a sort of longhouse. In Daepyeong, an archaeological site of the Mumun pottery period in Korea, longhouses have been found that date to circa 1100-850 B.C. Their layout seems to be similar to those of the Iroquois. In these, several fireplaces were arranged along the longitudinal axis of the building. Later, the ancient Koreans started raising their buildings on stilts, so that the inner partitions and arrangements are somewhat obscure. The size of the buildings and their placement within the settlements may point to buildings for the nobles of their society or some sort of community or religious buildings. In Igeum-dong, an excavation site in South Korea, the large longhouses, 29 and 26 meters long, are situated between the megalithic cemetery and the rest of the settlement. The longhouse may be an old building tradition among the people of Austronesian origin or intensive contact. The Austronesian language group seems to have spread to south east Asia and the Pacific islands as well as Madagascar from the island of Taiwan. Groups like the Siraya of ancient Taiwan built longhouses and practiced head hunting, as did, for example the later Dayaks of Borneo. A modern Iban longhouse in Kapit Division, Sarawak. A modern timber longhouse at Sungai Asap, Belaga, Sarawak. Many of the inhabitants of the Southeast Asian island of Borneo (now Kalimantan, Indonesia and States of Sarawak and Sabah, Malaysia), the Dayak, live traditionally in buildings known as longhouses, Rumah panjang / Rumah Betang in Malay and Indonesian, rumah panjai in Iban. Common to most of these is that they are built raised off the ground on stilts and are divided into a more or less public area along one side and a row of private living quarters lined along the other side. This seems to have been the way of building best accustomed to life in the jungle in the past, as otherwise hardly related people have come to build their dwellings in similar ways. One may observe similarities to South American jungle villages also living in large single structures. The design is elegant: being raised, flooding presents little inconvenience. The entry could double as a canoe dock. Cooling air could circulate underneath the raised floor of the dwelling, and the elevated living areas were more likely to catch above ground breezes. Livestock could shelter underneath the longhouses for greater protection from predators and the elements. In modern times many of the older longhouses have been replaced with buildings using more modern materials but of similar design. In areas where flooding is not a problem, the space beneath the longhouse between the stilts, which was traditionally used for a work place for tasks such as threshing, has been converted into living accommodation or has been closed in to provide more security. Old longhouses in Asia were made of grass and tree bark. A wall runs along the length of the building approximately down the longitudinal axis of the building. The space along one side of the wall serves as a corridor running the length of the building while the other side is blocked from public view by the wall and serves as private areas. Behind this wall lay the private units, bilik, each with a single door for each family. These are separated from each other by walls of their own and contain the living and sleeping spaces for each family. The kitchens, dapor, may be situated within this private space but are quite often situated in rooms of their own, added to the back of a bilik or even in a building standing a little away from the longhouse and accessed by a small bridge. This separation prevents cooking fires from spreading to the living spaces, should they spread out of control, as well as reducing smoke and insects attracted to cooking from gathering in living quarters. The kitchen room also contains the dining room. Between the family apartment and kitchen, there can be an adjoining room where heirlooms like jars and brasswares are displayed. Behind the kitchen may be the bathroom and toilets. Further to this can be built another open veranda called pelaboh. A luvre is made on the roof to allow sunlight to permeate into the living and kitchen areas. A window opening is made between kitchens to allow exchange or sharing of food. The corridor itself is divided into three parts. The space in front of the door, the tempuan, belongs to each bilik unit and is used privately. This is where rice can be pounded or other domestic work can be done. A public corridor, a ruai, runs the length of the building in this open space. Along the outer wall is the space where guests can sleep, the pantar. Above the upper ruai, a panggau (hung suite) is built for young bachelors if the respective families to live and sleep. For maidens, a meligai is built over the upper main room, hung from the roof structure which is used for secluding maidens if the parents decide to do so, especially by the few aristocratic families. On this side a large veranda, a tanju, is built in front of the building where the rice (padi) is dried and other outdoor activities can take place. The sadau, a sort of attic, runs along under the peak of the roof and serves as storage. Sometimes the sadau has a sort of gallery from which the life in the ruai can be observed. The pigs and chicken live underneath the house between the stilts. The houses built by the different tribes and ethnic groups can differ from each other. Houses described as above may be used by the Iban Sea Dayak and Melanau Sea Dayak. Similar houses are built by the Bidayuh, Land Dayak, however with wider verandas and extra buildings for the unmarried adults and visitors. The buildings of the Kayan, Kenyah, Murut, and Kelabit used to have fewer walls between individual bilik units. The Punan seem to be the last ethnic group that adopted this type of house building. The Rungus of Sabah in north Borneo build a type of longhouse with rather short stilts, the house raised three to five feet of the ground, and walls sloped outwards. Many place names in Sarawak have "Long" in their name and most of these are or once were longhouses. Some villages like Long Semado in Sarawak have airfields. Regions with longhouses are for example Ulu Anyut and Ulu Paku in Sarawak. Another longhouse is the Punan sama. 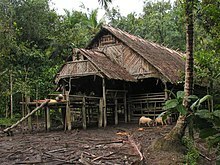 A traditional house type of the Sakuddei people, on the island of Siberut, part of the Mentawai Islands some 130 kilometers (81 mi) to the west off the coast of Sumatra (Sumatera), Indonesia is also described as a longhouse on stilts. Some five to ten families may live in each, but they are organized differently inside from those on Borneo. From front to back, such a house, called an "uma", regularly consists of an open platform serving as the main entrance place, followed by a covered gallery. The inside is divided into two rooms, one behind the other. On the back there is another platform. The whole building is raised on short stilts about half a meter off the ground. The front platform is used for general activities while the covered gallery is the favorite place for the men to host guests, and where the men usually sleep. The following first room is entered by a door and contains a central communal hearth and a place for dancing. There are also places for religious and ritual objects and activities. In the adjoining room the women and their small children as well as unmarried daughters sleep, usually in compartments divided into families. The platform on the back is used by the women for their everyday activities. Visiting women usually enter the house here. The Mnong and Rade of Vietnam also have a tradition of building longhouses (Vietnamese: nhà dài) that may be 30 to 40 metres (98 to 131 ft) long. In contrast to the jungle versions of Borneo these sport shorter stilts and seem to use a veranada in front of a short (gable) side as main entrance. The Rana Tharu is an ethnic group indigenous to the western Terai of Nepal. Most of them prefer living in longhouses called Badaghar with big families of many generations, sometimes 40-50 people. All household members pool their labor force, contribute their income, share the expenditure and use one kitchen. Traditionally, their houses are built entirely using natural materials such as reed poles for walls and thatch for roofing. ^ Pollard, Elizabeth (2015). Worlds Together, Worlds Apart concise edition vol.1. New York: W.W. Norton & Company, Inc. p. 34. ISBN 9780393250930. ^ Description of a Medieval Peasant Long-house at the English Heritage website. ^ "Flying Past - The Historic Environment of Cornwall: The Medieval Countryside". www.historic-cornwall.org.uk. Retrieved 16 March 2018. ^ L'Architecture Vernaculaire de la France by Christian Lassure, with a translation in English here. ^ Snow, Dean (1995). Mohawk Valley Archaeology: The Sites (PDF). Matson Museum of Archaeology, Penn State University. ISBN 0-9647913-0-7. Retrieved May 2, 2016. ^ a b Paula, Harris; Bellingham, Katy; J Fox, James (September 2006). Inside Austronesian Houses: Perspectives on Domestic Designs for Living - Chapter 4. Posts, Hearths and Thresholds: The Iban Longhouse as a Ritual Structure Prev - Sources and Elders. Australia: Australian National University. pp. 70–71. ISBN 1 920942 84 X. Retrieved 13 November 2017. ^ As described by Reimar Schefold, Speelgoed voor de zielen: Kunst en cultuur van de Mentawai-eilanden. Delft/Zürich: Volkenkundig Museum Nusantara/Museum Rietberg. (1979/80) and others. Morrison, Hedda. (Fifth impression 1974). Life in a Longhouse - Borneo Literature Bureau Kuching, Sarawak, Malaysia. Printed in Hong Kong by Dai Nippon Printing Co. (Int.) Ltd. - with translations to Malay, Iban and Chinese (Pendiau Dirumah Panjai - Kehidupan Di-Rumah Panjang). Short introduction text followed by the photo section (ca. 170) with quite detailed descriptions to each photo in the four languages. Dickson, M.G. (Third edition (revised) 1968). Sarawak and its People - Borneo Literature Bureau. Printed in Hong Kong by Dai Nippon Printing Co. (Int.) Ltd. Basic school book keeping the language simple and explaining things so children unaware of the world outside of their village can easily understand. Yet, as school books often are, very rich in information. On page 100 is a drawing of a longhouse (cut open) with a detailed description. Some of the photos are from Hedda Morrison; see her book Life in a Longhouse. Inside Austronesian Houses: Perspectives on domestic designs for living with long sections on Borneo longhouses. Population listing of some of the ethnic groups of Sarawak, Malaysia. Borneo (Kalimantan) Kenyah-Kayan traditional art. Robert J. Barrett (file dated 6 May 2004), "Space, repetition and collective interlocution: Psychiatric interviews in a Borneo longhouse" (pdf format). Communication & Medicine 1(1) (2004), pp. 25–34. Dense study of schizophrenia, but includes two pages of "2. Longhouse architecture: Ruai, bilik and sadau", with a plan view and elevation view; and detailed references. Royal Ontario Museum longhouse village View a North American longhouse village, Ontario, Canada. Collections & Research Online image collection.